DUNCANSVILLE, Pa. (May 5, 2016) – Better Business Bureau accredited and Houston-based 501(c)(3) non-profit organization, Helping A Hero, will break ground on its second specially adapted home in the state of Pennsylvania, this time for local community member, EM1 (NUC) Jeffrey Campbell, USN, on Wednesday, May 11 in Duncansville, Pennsylvania. To honor Campbell's selfless military service, Country Music Hall of Fame members, The Oak Ridge Boys, will sing the National Anthem at the groundbreaking ceremony. Community members are encouraged to attend to show their support. Campbell suffers from multiple sclerosis (MS) as a result of prolonged exposure to unknown substances in his time in the Navy serving as a nuclear electrician on the USS George Washington during the attack on the USS Cole, and while stationed in the New York harbor shortly after September 11, 2001. Due to the MS, Campbell has lost the use of his legs and arms and is confined to a wheelchair. The new home will meet Campbell's unique needs, including special features such as wider doorways and hallways, an accessible bathroom and kitchen, flush thresholds, and other safety features. Helping A Hero Central PA made a generous donation to Helping A Hero to help fund the construction of this home. Helping A Hero completed its first home for a local wounded veteran in Pennsylvania in 2013, located in Harrisburg, for Retired Sergeant Dennis Leonard who lost his legs in Baquba, Iraq when an improvised explosive device detonated near a vehicle he was driving. Founded in 2006, Helping A Hero provides support for military personnel severely injured in the War On Terror by providing specially adapted homes for qualifying service members through partnerships made with the builders, developers, communities, and the veteran of honor. Helping A Hero strives to engage the community in providing services and resources for our wounded heroes and their families. Additionally, the non-profit organization provides additional support programs such as marriage retreats, caregiver retreats, recreational activities, emotional support, and financial support. The Helping A Hero Home Program has awarded 100 severely wounded heroes in 22 states a specially adapted home that addresses their physical needs. In 2016, Helping A Hero was accredited by the Better Business Bureau and applauded for meeting the Bureau’s ‘Standards For Financial Accountability,’ going above and beyond the requirements of law to be a transparent and accountable. Helping A Hero will also sponsor the 2016 National Memorial Day Parade in Washington, D.C. honoring our nation’s veterans and fallen heroes. Campbell grew up in Hollidaysburg, Pennsylvania where he played football, ran track, played in the orchestra, was active in his church, and was an Eagle Scout. He graduated from Slippery Rock University where he was an athletic trainer and vice president of the Rock Emergency Medical Services. Jeff and his wife Aimee have four children: Benjamin (16), Hannah (10), Noah (8), and Jonah (7). They are also expecting again in December. Two of their children have special needs, which adds to the family’s challenges. The groundbreaking ceremony for EM1(NUC) Jeffrey Campbell, USN, is open to the public and all community members are invited to attend. 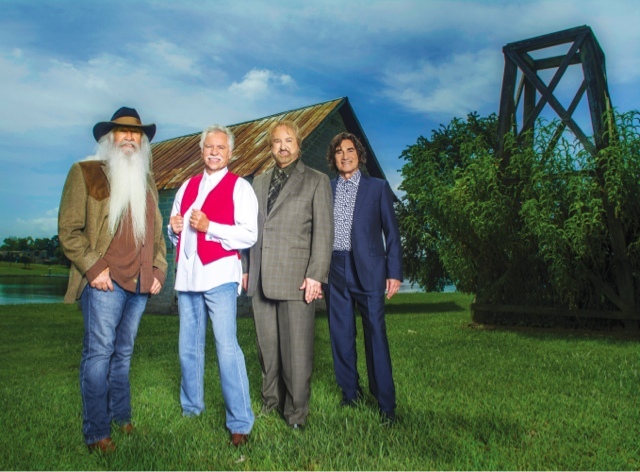 “It’s always an honor for The Oak Ridge Boys to be a part of anything honoring our veterans. We are very happy this opportunity came up and look forward to it and meeting EM1 (NUC) Campbell and his family,” said Joe Bonsall of the Oak Ridge Boys, who will be present at the ceremony. Join Helping A Hero May 11, 2016 at 11 a.m. at Fox Hollow Subdivision 154 Fox Hollow Dr. Duncansville, PA 16635. Look for the flags and Helping A Hero signs to direct you to parking. A BBQ luncheon will be provided immediately following the ceremony. RSVP totx@helpingahero.org. More information on Helping A Hero can be found atwww.helpingahero.org.